looking to satisfy a snack craving, but trying to keep things on the ‘healthier side’? 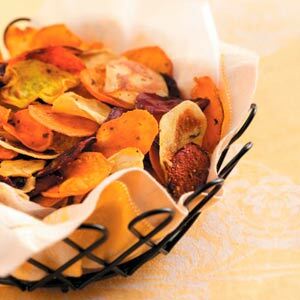 try out this easy recipe for homemade veggie chips – the trans fat is slashed, there is much less sodium than the ones you would find in the store, plus – it’s kinda fun to eat something you made ALLlll by yo’self! Thinly slice with a sharp knife or mandolin slicer. Toss in olive or coconut oil and evenly space them on a parchment-lined cookie sheet. Scatter with salt, dried thyme, and oregano. Bake for 20-30 minutes at 325*, checking often. Cut 1 bunch of kale into bite-sized strips. Sprinkle with sea salt, freshly cracked pepper, and a dash of apple cider vinegar. Bake for 18-20 minutes at 350*, toss after 10 minutes. Scatter with salt – or for a spicy twist try cayenne pepper, cumin and coriander. Bake for 10 minutes per side at 350*. thanks – hope you find them tasty!